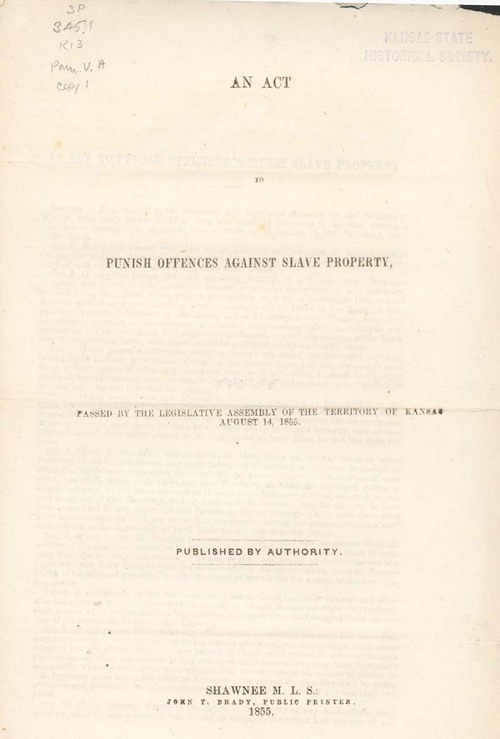 The Act to Punish Offences Against Slave Property was passed by the Legislative Assembly of Kansas Territory on August 14, 1855, to take effect on September 15, 1855. The Speaker of the House was J. H. Stringfellow, and the President of the Council was Thomas Johnson. The act included a death penalty for persons causing or aiding in any "rebellion or insurrection of slaves, free negroes, or mulattoes" in Kansas Territory. Other provisions dealt with "speaking, writing, or printing" that encouraged slaves to rebel or that argued that the right to hold slaves did not exist in Kansas Territory. Several sections of the act contained penalities for encouraging or assisting slaves to escape, and one stated that anyone opposed to the holding of slaves could not serve on a jury.